his delicious recipe no matter what time of the year it happens to be. Here are some tips on how you can Cajun fry your wild turkey bounty. Although you can certainly make this delicious meal any time of the year, Cajun fried wild turkey is fast becoming one of the most popular meals at the Mardi Gras table. One of the major themes and symbols of the carnival season is Boeuf Gras, which means ‘fatted bull.’ This is symbol for the last big meal of meat that is consumed before the Lenten season of fasting commences. Cajun-fried wild turkey is fast becoming a favored Mardi Gras meal—the perfect goodbye to meat, at least for a few weeks as the Lenten season slowly creeps by. There is perhaps no better way to saying goodbye to meat than by consuming a delicious meal of it in the form of a Cajun-fried wild turkey bounty. This Cajun fried wild turkey dish is relatively easy to prepare. You can serve it over rice, or complement it with a Caesar salad, some yeast rolls and some moon pies for dessert. 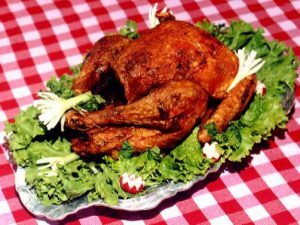 Here is what you will need to make this delicious Cajun fried wild turkey recipe. You will need: one pound of bacon, diced into pieces approximately ¼-inch in width. You will need four tablespoons of margarine or butter of your choice. You will need some Cajun poultry seasoning. You will need 1-½ cups of chopped onion, 1 boneless wild turkey breast, divided into one-inch chunks, four tablespoons of divided vegetable oil and one tablespoon of Worcestershire sauce. Use a large and heavy skillet to cook the bacon. Sprinkle the Cajun seasoning over the bacon, according to your personal preference. Fry the bacon until is crisp. Drain the bacon, making sure to discard of the grease. Set this aside for now. Then, in the same large skillet, add one tablespoon of butter. Sauté the chopped onion in the butter until it becomes soft and tender. Once cooked, remove the onion from the fire and set it aside for now. In a large bowl, mix two tablespoons of oil, the Worcestershire sauce, more Cajun seasoning, and the turkey breast. Heat butter in the same skillet until it begins to sizzle. Then simply add the onion, the turkey and the bacon. Now you want to sauté this until the turkey is brown and the texture becomes texture. One of the best ways to serve this en-tree of Cajun flavored flavors is to serve it over rice. This delicious fried wild turkey recipe is very flexible. You can prepare this meal no matter what time of the year it is. Simply serve it over rice and watch the intrigued expressions on the faces of those around the mealtime table. If you are thoroughly engaged in the process of Lent, you will be enjoying one of the finest of all exquisite and original meal-centered meals to be had anywhere around the table.